Chiropractic is the largest drugless, non-medical health care profession in the world. It is one of the most praised of all health care disciplines practiced by over 60,000 doctors worldwide, which is why over 25 million Americans visit the chiropractor each year. Modern chiropractic practice was born in Davenport, IA in 1895 by D.D. Palmer. 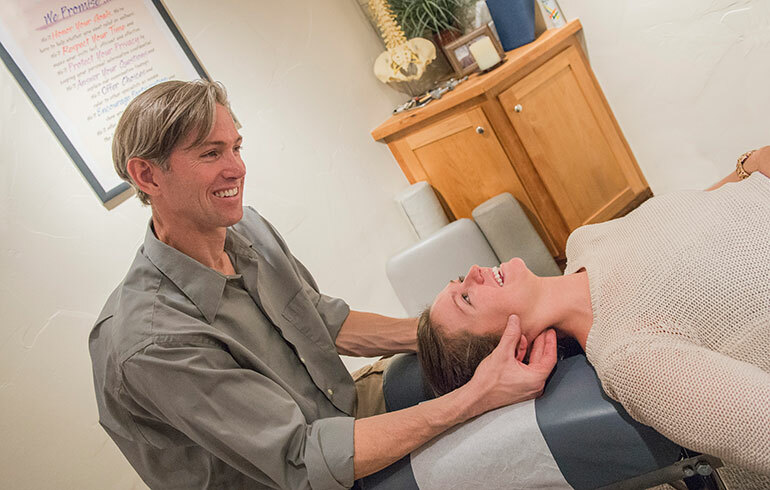 Chiropractic treatment involves both the self-healing, harmony, vitality of the body, and modern science in treatment. Practicing chiropractic teaches us to rid our lives of the elements that interfere with the bodies functioning. Drugs, pollution, chemicals, unnatural childbirth, stress, and anxiety, in addition to spinal nerve stress can interfere with the healing process. Symptoms: Nerve pressure created by subluxations can cause numbness, poor mobility, a “locked up” feeling, weakness, tenderness, or the under-performance of organs and tissues. Spinal misalignments can also cause nerve tissue to stretch or become irritated. Taking Action: Just about anyone can be adjusted. Newborns, infants, children, adults, seniors, and pre or post-surgical back patients can benefit. A spinal examination helps locate areas of nervous system compromise. The moving bones of the spine are common culprits. During an adjustment the doctor’s hands deliver a quick, highly accurate thrust. Many patients report a sense of well-being or a feeling of calmness, others feel immediate improvement of mobility. In some cases, X-ray’s may be used to determine the cause of your pain or dysfunction. Your doctor comes highly trained in the sciences that are virtually indistinguishable from the medical field. The main difference is that medicine seeks to treat the symptoms of the disorder while chiropractic seeks to correct the cause of the disorder. Committing to your own well-being and focusing on your chiropractic program, established by your doctor, are the first steps to wellness.